Need an SUV with plenty of capability, room for five people, and available all-wheel drive? Then you are likely considering a Kia or a Chevy. We can help you come to the right decision with our 2019 Kia Sportage vs 2019 Chevy Equinox comparison. We will get into the nitty-gritty details of the numbers to come to a conclusion. When it comes to price though, both models are fairly comparable. However, the Sportage will always come out with a slightly lower price than the Equinox. 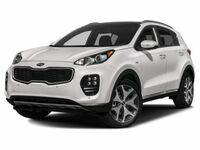 If that’s enough to convince you that the 2019 Kia Sportage is the right SUV for you, then you can click the link below to see a Sportage inventory right here in Puyallup, WA. Otherwise, keep reading to learn how other aspects of these two models compare. Should you buy a Kia or Chevy SUV? Chevy may be a brand that’s known for power, but they certainly don’t bring it out the gate with the Chevy Equinox. Instead, the Sportage gives you more standard horsepower. That’s not all the Sportage has to offer though. With the top SX Limited trim, you get a 2.0-liter turbo engine that is capable of outputting 237 horsepower and 260 pound-feet of torque. The Sportage puts that power to work too by providing more max towing capability. You won’t be stuck just towing either because behind the second row, you can stow 30.7 cubic-feet of cargo while still accommodating your five passengers. Fold down that second row, and then you get up to 60.1 cubic-feet of cargo capacity. Both the Equinox and the Sportage start with comparable fuel economy with the Sportage getting 30-city mpg and the Equinox getting 32-city mpg. However, the Sportage has a larger fuel tank. With this example, the Sportage will get 492 miles of range and the Equinox will only get 476.8 miles of range. To top this whole conversation off, the Sportage gives you a huge warranty with powertrain coverage that lasts up to 10 years or 100,0000 miles. This is double the time and nearly double the miles that the Equinox provides. Interested in a 2019 Kia Sportage?